Featuring: Vincent Price, Boris Karloff, Peter Lorre, Jack Nicholson. Director: Roger Corman. 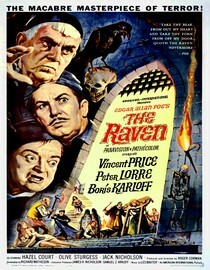 Today in the second part of my Vincent Price review marathon we have The Raven starring the trio of Price, Karloff and Lorre once again and surprisingly featuring a very young Jack Nicholson. When I watched the movie I didn't even realize it was Nicholson, that's how young he was. I thought the movie had all the markings of a good Vincent Price movie, but I was wrong. It was loosely based on Edgar Allan Poe's The Raven and when I say loosely, I mean really loosely. The only connection there really was is that there was a Raven in the movie. I can't really recommend this movie to anyone unless you're really a Vincent Price aficionado or want to see what Jack Nicholson looked like when he was 15. There is a wealth of Vincent Price movies on Netflix, start elsewhere. Why is it in your queue? Because Vincent Price is awesome. Best thing about the movie? The extremely cheesy sorcerers battle at the end of the movie. What mood should I be in to watch this movie? In a mood to watch a really silly b-movie.